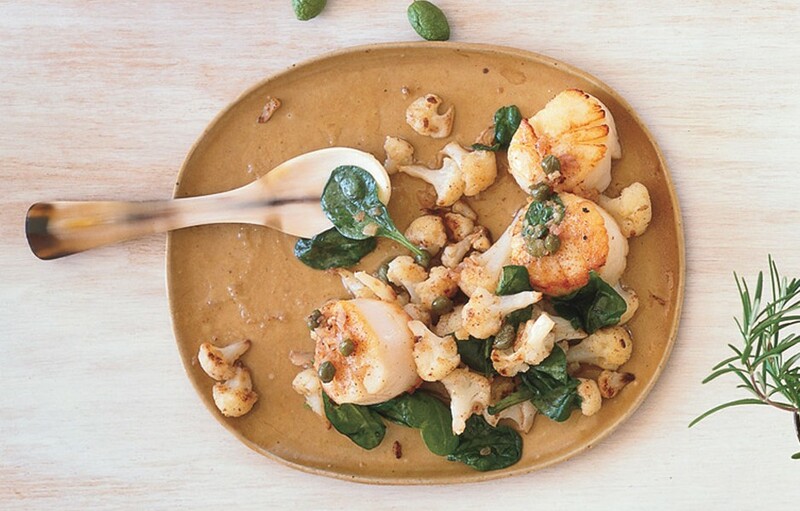 Scallops with Cauliflower, Dried Cherries, and Capers. This pretty dish calls for a surprising yet delicious combination of foods, each with its own nutritional bonus: Scallops are an excellent source of the antioxidant selenium; cauliflower contributes vitamins C, K, and cancer-fighting compounds; spinach adds a large dose of vitamin A and folate; and dried cherries are even higher in age-fighting antioxidants than blueberries (which have gotten the majority of the media buzz for their superfood status). 1. Cook cauliflower florets in large pot of boiling salted water until tender, about 6 minutes. Drain and transfer cauliflower to bowl. Heat 1 tablespoon oil in same pot over medium-high heat. Add spinach and toss until just wilted but still bright green, about 3 minutes. Transfer spinach to sieve set over large bowl and drain well. Reserve pot. DO AHEAD: Can be made 2 hours ahead. Let stand at room temperature. 2. Heat 1 tablespoon oil in reserved pot. Add half of shallot; saute 1 minute. Sprinkle cauliflower with cinnamon, salt, and pepper. Add to pot and toss to coat. Add spinach and toss until heated through, about 3 minutes. Divide vegetables among 6 plates. 3. Meanwhile, heat remaining 1 tablespoon oil in medium skillet over high heat. Sprinkle scallops with salt and pepper. Add to skillet; sear until just opaque in center, about 2 minutes per side. Place 1 scallop on each plate. Melt butter in same skillet. Add half of shallot and last 3 ingredients. Cook until butter starts to brown, about 4 minutes. Spoon over scallops and serve.